iOS devices are frequently used to take photos of objects or documents. If iCloud is turned on photos are automatically synced across all iOS devices using the same Apple ID in the so-called Photostream. A direct transfer of photos from the camera roll or the photostream to an external storage or another device using a different Apple ID is not possible. Sharing photos via Apple’s Photostream (by E-Mail) is followed by substantial loss of quality. 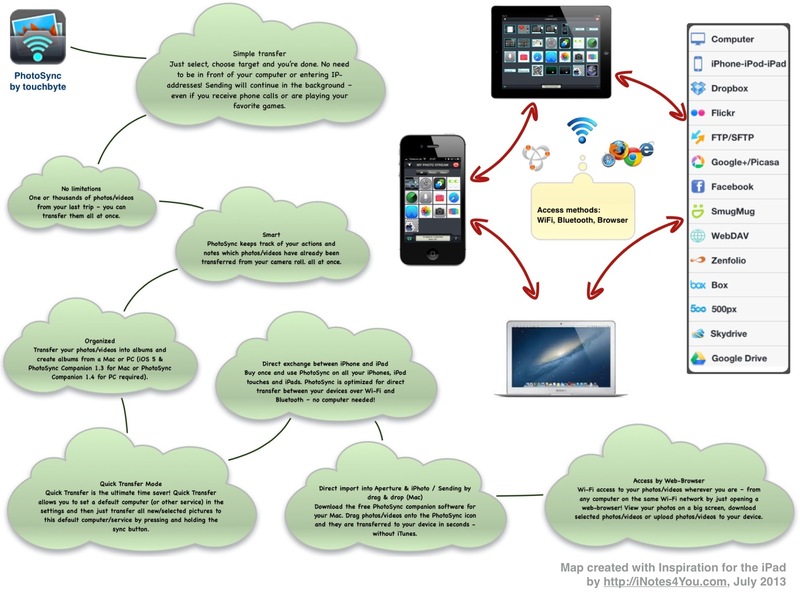 Sharing via a cloud client is time-consuming and not recommended if the destination device is in the same WiFi network or can be connected to the source device via Bluetooth. I have often wondered why Apple didn’t offer a seamless transfer from one iOS device to another. Regarding this point Apple did not follow it’s own strategy of seamless usage. With iOS 7 Apple will eradicate this flaw by introducing AirDrop. Sending a photo or a document to someone via text or email is fine. But if that someone is right next to you, a text or an email suddenly feels like too many steps. Enter AirDrop for iOS. It lets you quickly and easily share photos, videos, contacts — and anything else from any app with a Share button. Just tap Share, then select the person you want to share with. AirDrop does the rest using Wi-Fi and Bluetooth. No setup required. And transfers are encrypted, so what you share is highly secure. Unfortunately AirDrop is not available for previously supplied iPhone 4S, 4, etc. and iPad 3rd Generation, iPad 2, etc. So there will be still a need for an app which does the task seamlessly. There is an app available in Apple’s App Store named PhotoSync (by German developer touchbyte GmbH) which offers many options to transfer photos wirelessly in a simple way with a perfect UI (user interface) as well as a perfect UX (user experience). Just select multiple photos from the camera roll, photostream or self-created albums, select the destination device or cloud storage and you’re done. Sending will continue in the background – even if you receive phone calls or do other things with your device. The maximum transfer rate is up about 2.5MB/s that means about 2-3 photos/s (depending on device and network). Using Bluetooth I transferred 23 images with total size of 17 MB within 81 s which is a transfer rate of o.21 MB/s compared to a transfer rate of 0.68 MB/s when using WiFi with an Apple Airport Extreme router. So the maximum transfer announced by the developer is a dream. Nevertheless it works fine and it’s much faster than any transfer via a cloud storage (device – cloud – device). allows to set a default computer (or other service) in the settings and then just transfer all new/selected pictures to this default computer/service by pressing and holding the sync button. allows transfer from one iOS device to another with a different Apple ID if both devices are in the same WiFi network or Bluetooth is turned on. It’s always a good idea to see some screenshots before deciding to download an app from the App Store. There is still no way without stumbles to give an app back and get a refund if it’s not the right app or it has severe bugs. The settings screen shows you some options as well as supported external storages. The running app shows that there is an understandable and informative feedback for users. That’s the price you have to pay when contacting extraterrestrial Androids. If you are fully integrated in the Apple hardware ecosystem you may own an Apple router like Airport Extreme. The APE has a USB port but unfortunately PhotoSync cannot communicate with an USB storage connected to the APE. This is called Network Attached Storage (NAS). So there is no chance to copy photos from your iOS devices to the USB storage. The only way to do this is to install another app like FileBrowser by Stratospherix. Configure a new connection with the option TC (Time Capsule, Airport Extreme), enter the local IP address of this device as well as your username and password for WiFi access. 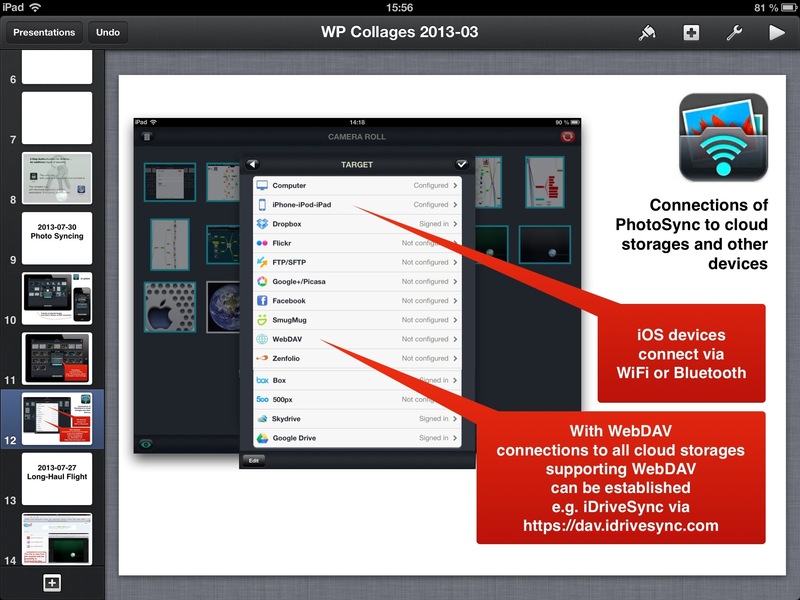 FileBrowser then allows copying photos from your iPad/iPhone to the attached storage. 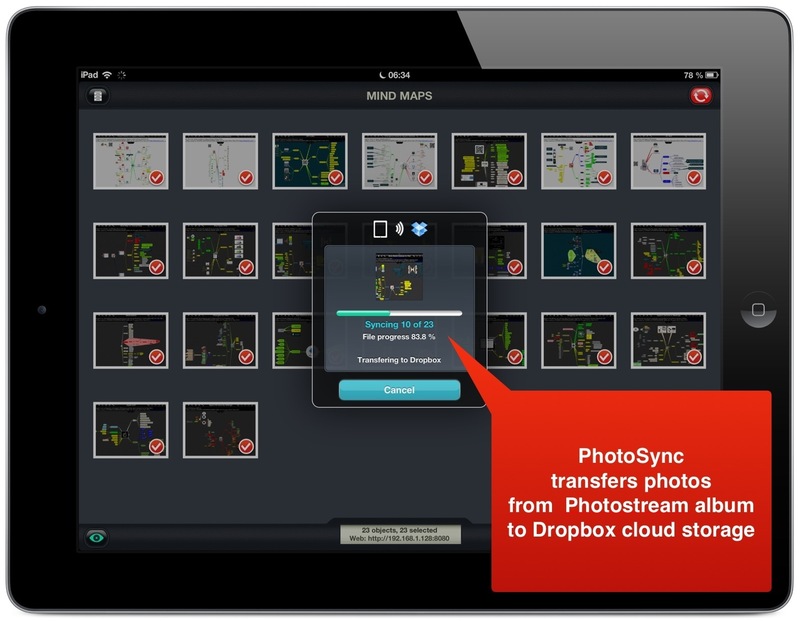 PhotoSync Companion for Mac OSX or Windows is a FREE utility to support the best transfer performance (unlimited number of images, background transfer, etc) for picture and video transfers from your iPhone, iPod Touch, or iPad to your Mac or Windows PC with the PhotoSync app. In iOS 4 and iOS 5 location services must be enabled to use the application! In iOS 6 Apple changed the access to photos from ‘location services’ to ‘photos’. For best transfer experience and performance, we recommend installation of the free PhotoSync Companion Software. 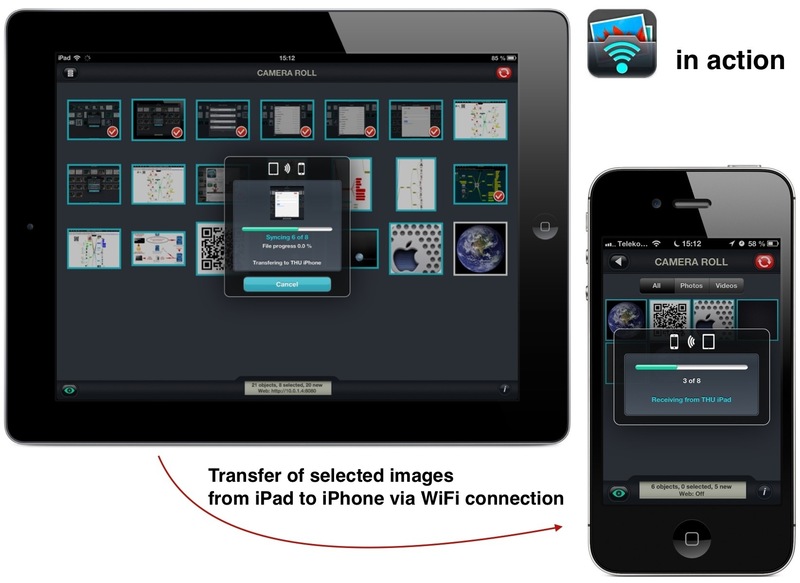 There is another app for seamless transfer of photos from one iOS device to another available. It’s Safety P+V by 83 Technology with the additional feature to protect use of the app and access to all photos and videos stored in the app’s local folder by entering a password.